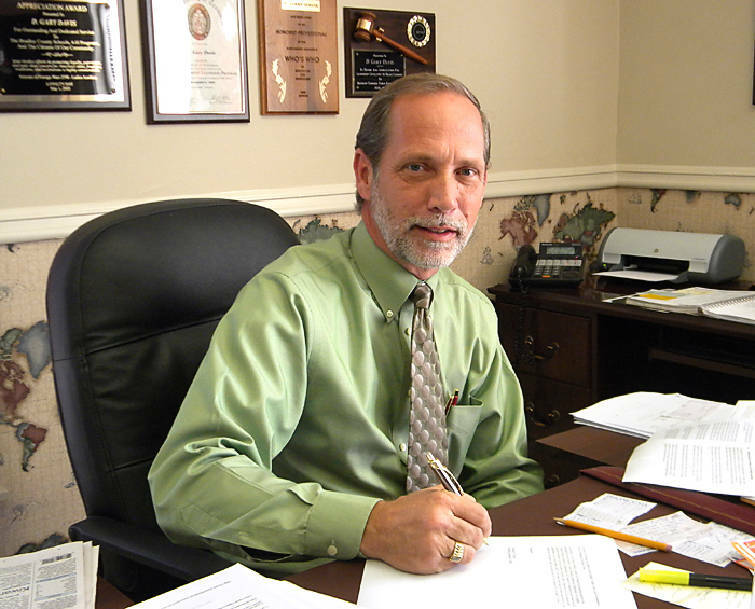 Bradley County Mayor D. Gary Davis sits at his desk. CLEVELAND, Tenn. -- The city turned down an offer from Bradley County on Monday of an $850,000 settlement in the sales tax dispute between the two. Instead, the City Council adopted a resolution saying the city interprets a Chancery Court ruling to mean the city is due $2.27 million from the county. The council's resolution traces the history of the dispute to a city-county workshop on Oct. 21, 2008, that included discussions of the need for money for capital projects and of asking voters to approve a local half-percent sales tax increase. The council voted to seek the referendum, which city voters approved March 10, 2009. The County Commission initially voted against a referendum but changed course after the city vote and held its own referendum on May 14, 2009. The county referendum did not restrict the revenue to capital projects, which was spelled out on the city ballot. The dispute is over how, or if, to share some sales tax proceeds. In general, the two governments have shared revenue based on a 1967 agreement, but the city holds that the latest increase is not covered by the agreement. Chancellor Jerri Bryant ruled for the city on July 5. The city's resolution, which passed the council unanimously Monday, says Bryant's ruling calls for the city to receive $1.4 million from the county in collections from the time of the city referendum to the end of the fiscal year on July 30, 2010. That was the amount the county distributed to the county school system. The resolution also says the city is due another $845,384 in "funds accumulated by the Bradley County Trustee while the lawsuit was pending." On July 18, the County Commission adopted its annual budget but did not vote on a property tax rate, pending the council's meeting Monday. The city's resolution states the council "is concerned" that immediate repayment of the $1.4 million would create a hardship for the county. The city "would be willing to allow the repayment" on or before March 15, 2014, the resolution says, in exchange for the county's agreeing to site-of-purchase-based sales taxes beginning July 1, 2013. The phase-in of repayments would coincide with "the substantial additional property taxes" the county will receive in fiscal year 2014 from Wacker Chemical, City Council members said. "We don't want to get in a position where the county would have to raise property taxes," Councilman Richard Banks said. "City residents are county taxpayers, too." The city's counterproposal "is about as fair as the council can be," Mayor Tom Rowland said. County Mayor D. Gary Davis urged county commissioners to set the property tax rate at next week's voting session with no increases. "Who knows what will happen with the tax dispute," Davis said. The Bradley County Commission met with its attorney Monday evening before the start of its regular work session. None of the commissioners placed a sales tax dispute item on next Monday's voting agenda. The council met with its attorney Monday before taking the vote. If the county does not accept the city's counterproposal by Aug. 2, the city's attorney is authorized to take further legal steps.